Why Do We Need a Docking Station? In today’s PC-driven world, it’s essential to have all your peripherals and extra monitors right there at your fingertips. That is why the Diamond UltraDock – Docking Stations play such an important role in staying productive and efficient in any kind of work that you do. It is simply the best connectivity solution there is. These docking stations add Ethernet, audio, dual video support and 6 USB ports through a single USB connection. You can enjoy Dual-Video by connecting extra monitors all from 1080P resolution all the way up to 5K resolution. With one simple cable connection to your computer, you can have access to another PC monitor, HDMI large-screen displays, stereo speakers, external hard drives, optical disk drives, printers, USB keyboard, mouse, and other USB devices. There’s even an Ethernet port for your network connection. The benefits of the Diamond UltraDock – Docking Stations go far beyond just better connectivity. By having it by your side, you can have the satisfaction of knowing that its rock-solid dependability will get you through your workday without any issues. Whether you just need it to add a simple display monitor, or you want to create a work super-station, the Diamond UltraDock Docking Stations are the perfect solution to creating order in a busy, PC lifestyle. You can have one at home and use it with your laptop to connect it to other monitors. You can also have one at the office and have it connected to all of your peripherals such as USB printers, PC cameras, hard drives and even a 5K monitor. 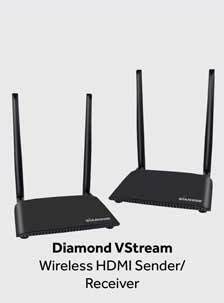 The Diamond Thunderbolt ™ 3 TB3000DS Docking Station allows you to use one single connection from your computer to additional USB peripherals such USB printers, USB external drives, mice and keyboards. It also includes a Gigabit Ethernet port, audio input/output. 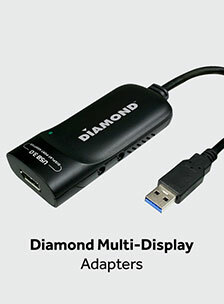 The Diamond Thunderbolt ™ 3 Docking Station will also charge your laptop/notebook computer at the same time through Thunderbolt 3 interface. True Plug and Play, with built-in drivers you do not need to download or install additional drivers. 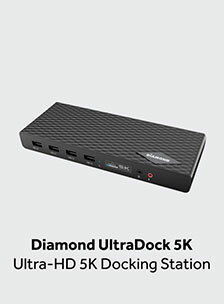 The Diamond Ultra-Dock 5K Universal Docking Station is compatible with both Type-C and Type-A USB Laptops/Desktop PC’s. 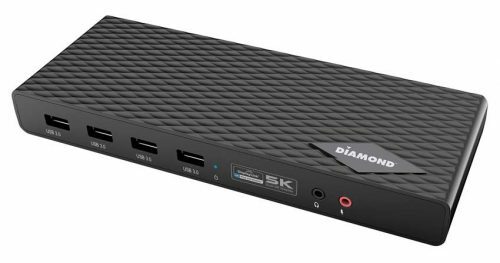 The Diamond Ultra-Dock provides six additional USB 3.0 ports, Fast Gigabyte Ethernet Port, separate Mic input and Audio output. Display Link Certified, DL- 6950 chip. One USB Connection- to your laptop computer you can have access to 4K displays, stereo speakers, Headset, Mic, external hard drive, optical disk drive, printers, USB keyboard, Wired Gigabit Ethernet, mouse and other USB devices. Now with one simple cable connection to your computer, you can have access to large screen displays, stereo speakers, external hard drive, optical disk drive, printers, USB keyboard, mouse and other USB devices. 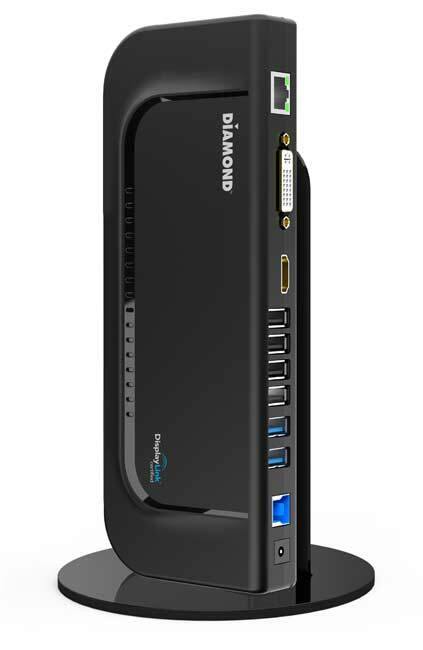 The Diamond MDS3900 USB 3.0 to HDMI/VGA mini Ultra Docking station allows easy plug and play installation for multiple displays/monitors. Enhance your laptop’s visual experience by adding 2, 3 or up to 6 displays in minutes. 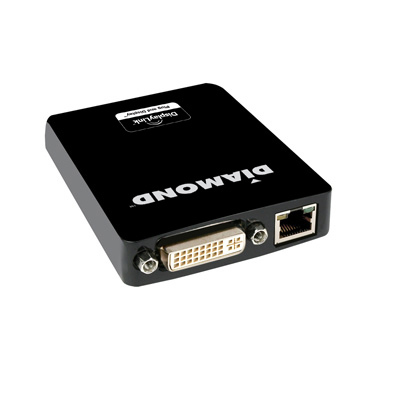 (Each Display requires an additional MDS3900 adapter, each adapter supports dual head video output, support for HDMI and DVI/VGA simultaneously.) 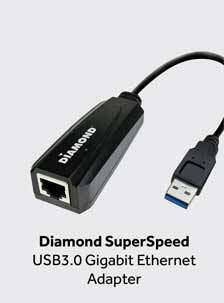 Gigabit Ethernet support, upgrade or add Ethernet wired connectivity to you laptop, Macbook, and Ultra dock with one single USB connection.